The E4N cohort study: what is it? E4N is an on-going prospective cohort study based on the existing E3N cohort of ca. 100,000 French women initiated in 1990. It will ultimately include the spouses (specifically, the fathers of E3N women’s children), children, and grandchildren of the E3N women. E4N is a “family cohort” built on 3 generations. It will expand the E3N cohort study by investigating health and disease in men as well, and by creating a suitable framework to investigate familial aggregations of diseases through common exposures and/or genetics. What are its scientific objectives? 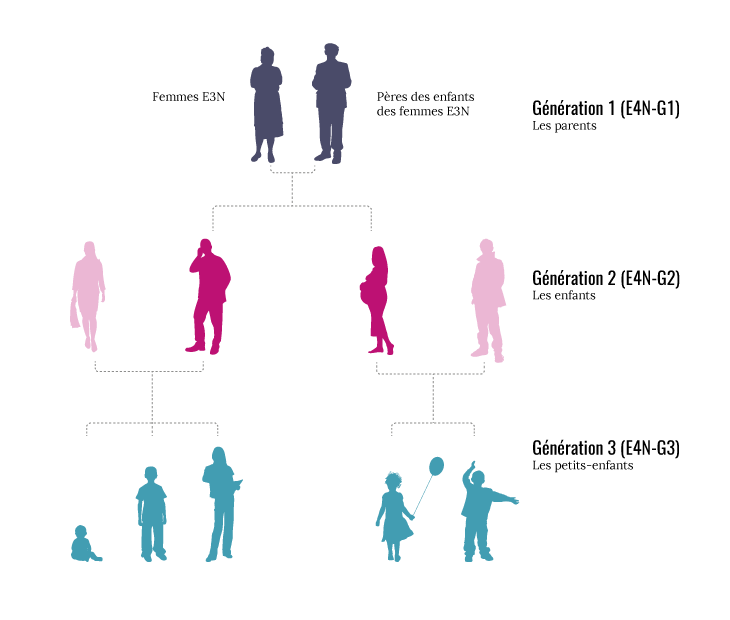 We will collect genetic information on 3 generations in order to disentangle the influence of lifestyle, family environment and genetics on health. The E4N family cohort design is thus a unique setting to discover potentially novel susceptibility genes and explore gene-environment interactions. We also want to develop interactions between basic sciences, clinical research and public health approaches. One of the main transversal axes of the E4N study is to evaluate the benefits of using new technologies and connected objects in medical research (to recruit, collect information, and maintain participation) and to develop e-epidemiology. How is the E4N study funded? In 2011, the E4N project has been selected as an “Investment for the future” grant by the French National Research Agency (ANR). The recruitment of 20,000 E4N fathers (Generation 1) and the collection of questionnaire data as well as biological samples started at the end of 2014 and is still ongoing. The recruitment of E4N children (Generation 2) and grandchildren (Generation 3) will start in early 2017. More information in English will be available soon.